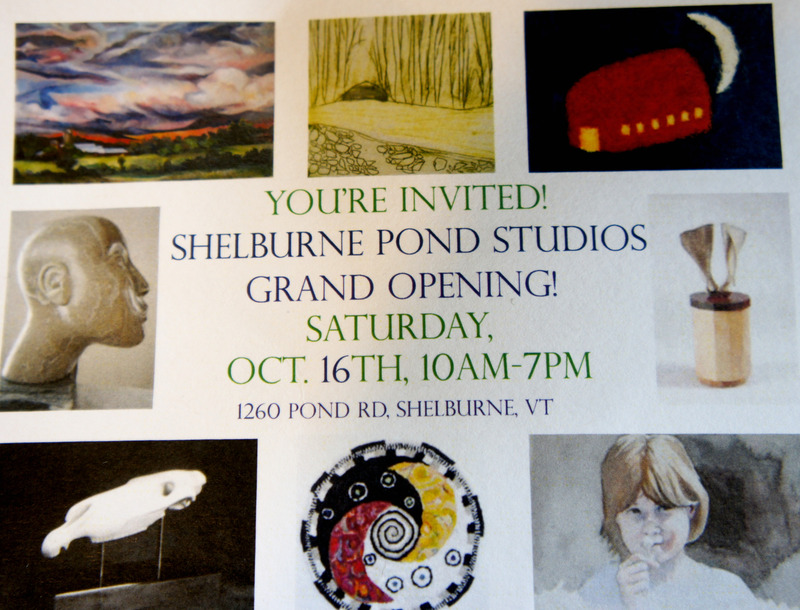 You are cordially invited to Spring Open Studio Weekend on Memorial Day Weekend: May 28th and 29th, at Shelburne Pond Studios: 1260 Pond Rd, Shelburne, VT, as part of The Vermont Crafts Council State-wide Open Studio Weekend. Eleven artists inside their barn studios and several site specific sculptures set amidst the adjoining meadows. Live Music on both Saturday and Sunday, as well as hors d’oeurves… and hamburgers/veggie burgers available at a low price. Laurel Fulton- landscapes in oil, watercolor, and prints. 10am – 5pm (both days). Lots of art work to see and purchase. We will also have information on other Open Studios in the area should you choose to make a round robin of studio visits throughout the weekend! Support artists who’ve been working all winter and look forward to sharing what they’ve been up to! Please tell your friends, and we’ll see you at the Barn! 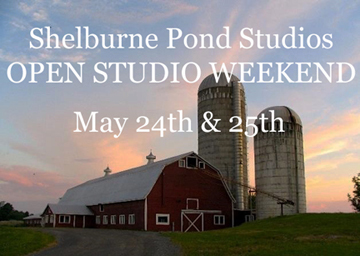 All of us here at Shelburne Pond Studios would like to personally invite you to our new and expanded 2014 Open Studios Weekend. This year we expanded participation in our Open Studios Weekend to the community at large, making it an event not to miss. 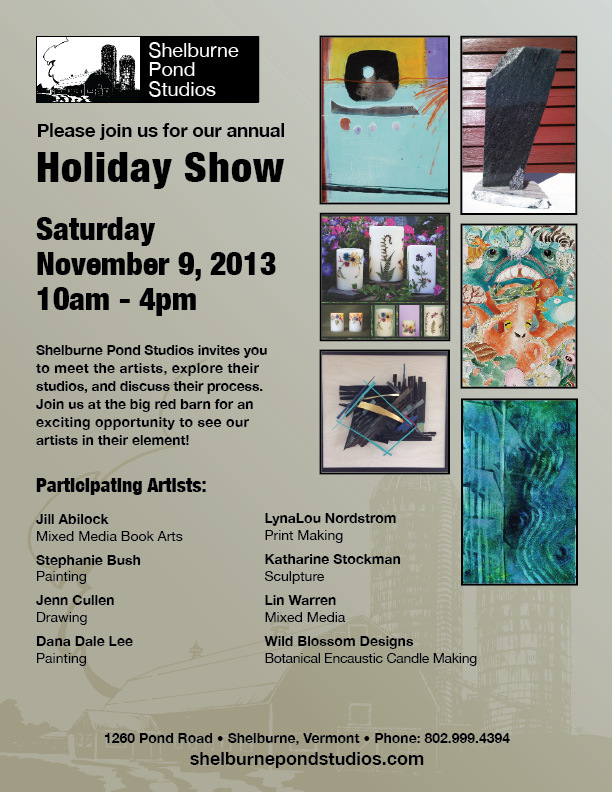 We have 6 additional artists exhibiting, live musical entertainment throughout the weekend, food vendors and a Shelburne Community School student art exhibit. We also have 4 new outdoor sculptures in our year round sculpture exhibit.Come and wander, see wonderful art, enjoy good food and music, picnic if the weather permits. We’re excited and hope you will be too. See you there!! There’s a vibrant and supportive artists’ community and outdoor sculpture exhibit located on a farm and in a renovated dairy barn just across the road (Pond Road) from Shelburne Pond in Shelburne. When owners Katharine Stockman and Rad Romeyn bought the property is 2004 the barn had been sitting vacant for several years, except for hay in the loft and an antique tractor. The community started in 2010 when the owners began taking out the cow stalls one by one and replacing them with walls and doors, using recycled materials wherever possible. The first artists moved into their new studio spaces within several months of the beginning of construction. There are now 11 artists’ studios and 14 artists in the barn and a stone carving studio across the barnyard. The 14 artists in situ work in a variety of mediums; stone, glass, silk screen, fiber, oil paint, acrylic, encaustic, wood, pencil, charcoal and more. Fourteen large sculptures adorn the 12 acre property. All are for sale, are a variety of sizes and are in stone, steel, concrete and mixed media.